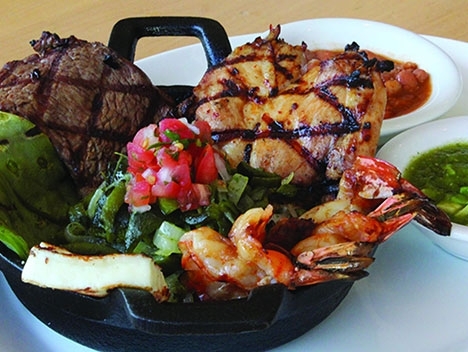 Surf and Turf with a Mexican twist is one of the featured Dine LA dishes at Loteria Grill. Dine LA Restaurant Week is back starting today through July 26. Here’s your chance to try out some new restaurants with special three course prix fixe menus (from $15-$45 per person depending on the restaurant.) Check out DineLA for more information about where to find participating restaurants near you. It’s happening in the valley and city-wide, so make your reservations now. Worth the Drive: The Fifth Annual Taste of Farmers Market at the Original Farmers Market (Third and Fairfax) is happening tomorrow, July 16 from 5 p.m.-9 p.m. It’s a roving feast with over 50 restaurants and grocers at the Farmers Market serving samples of their mouth-watering fare. Also the Market’s many retail establishments will also offer specially-priced merchandise for Taste of Farmers Market customers. Each ticket includes one sample per stall/vendor as well as two drink vouchers redeemable for non-alcoholic beverages, plus free parking. The Original Farmers Market, 6333 W. Third St., Los Angeles; (323) 933-9211. $35 presale; $40 at the door. Take a glimpse and watch this video about the Farmer’s Market that includes Loteria Grill’s Chef Jimmy Shaw (who originated in the Market, but we’re lucky to have him in the 818 too!). The Daily Grill in Studio City is having a very special wine tasting event tomorrow, Tuesday, July 16. Five wines from Tolosa Winery will be poured and paired with chef-inspired appetizers that include Heirloom Tomato Salad with Fresh Mozzarella, Chicken Piccata, Crabcakes with Beurre Blanc, Wild Mushroom Risotto, Sliced Filet Medallion with Bordelaise. There will be a representative from the winery to answer questions. The cost is $25 per person. The last tasting sold out fast, so RSVP by calling 818-769-6336. Space is limited. Spumante Restaurant in North Hollywood is taking reservations for a special wine pairing dinner on July 30 at 7 p.m. Join Gourmet Wine Getaways’ international wine expert Peter Kerr for a 5-course gourmet dinner featuring the wines of Costa de Oro Winery, Santa Maria, CA. The special guest will be owner/winemaker Gary Burk. Cost is $75 per person, inclusive of tax and gratuity. For reservations, contact: Spumante Restaurant: (818) 505-7716. Advance reservations are required and must be guaranteed with a credit card. Complete menu is available by email: perspective@earthlink.net . Spumante is located at: 11049 Magnolia Blvd. (just east of Lankershim ), North Hollywood. “Adventurrito” Treasure Hunt: Celebrate the Chipotle’s 20th anniversary with a puzzle contest that will reward 20 grand prize winners with free burritos for 20 years . This three-week-long treasure hunt will take participants through a series of 20 online puzzles and daily prizes that will lead to the ultimate grand prize: free burritos for 20 years. Check out how you can play to win.